I have been a professional artist for over 40 years. I started painting at a very early age. I was only eighteen when I was commissioned by a National Brewery to produce artwork for a national audience. I have an extensive and comprehensive background in graphic design. I owned and operated a very successful graphic art business in Sydney, Australia and also taught art to adults at Technical College. I worked as an artist in London for a few years before travelling around Australia, painting the country's remarkable landscapes. I now live on the Gold Coast, Queensland. I run a thriving business, teaching painting to all levels of students and derive great joy in mentoring my students and sharing my knowledge. I have held very successful solo, mixed and student art exhibitions on the Gold Coast. My paintings are exhibited in various art galleries in Australia and have sold paintings throughout the world. In 2010 I was invited to a Christian church, which I loved instantly and two weeks later I gave my life to Jesus. The following week I found out I had breast cancer. I could not have gone through the next year of surgery, chemotherapy and radiation without the presence of God in my life and my family’s. The strength and love from God was so powerful, He put people in my life to build my Faith and to show me His love. While I was going through the ordeal of chemotherapy I would find the strength to paint a few hours a day to take my mind off the deliberating effects of the chemo. 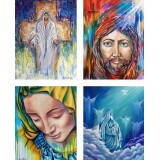 During these months, I produced a collection of beautiful God inspired paintings. (some of these are in Valerie Murphy’s books) I put them on my website and a week later was contacted by a New York art gallery who asked to represent me. The following year when I had recuperated, I had a successful exhibition in New York City, which had always been a dream of mine. God is so good. I continue to paint every day and I am always guided by the Holy Spirit. I am blessed that God has given me this gift that I can share with others.